I am a fundraising and organizational development consultant, working with non-profit organization boards and staff to help them become better leaders, advocates, and fundraisers. In other words: You can raise more money for your organization. I can help. I have worked in membership fundraising, major donor development, communications, marketing, and senior administrative management for 30 years, including nearly half that time with Nature Conservancy (TNC) chapters in Oregon, Texas, and Wisconsin. I also served TNC nationally as an internal fundraising consultant and major donor development trainer. Following my work with TNC, I served 9 years in senior administrative management with the Sand County Foundation. 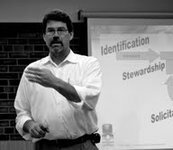 I consider myself a strategic thinker, problem solver, facilitator, educator, and program developer who brings a particular passion for conservation and the environment. Various blog posts by David are cited in the guide.